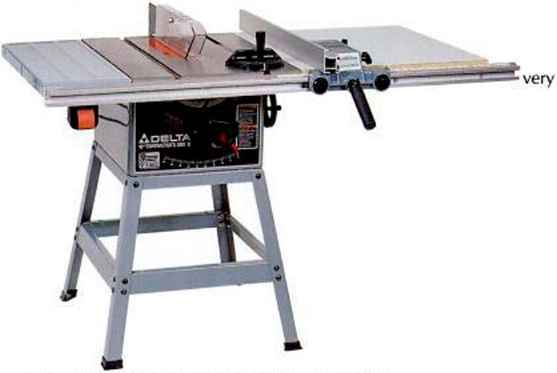 A veneer saw will cut veneer without splitting the grain as a knife will. But the saw teeth need to be sharp, beveled on the face of the blade, and honed flat on the back. Clamp the veneer to the substrate. Clamp the glued-up assembly between MDF platens and wooden cauls, using waxed paper as a glue resist. Glue on the edge veneer, using tape to position it, and clamp two opposing edges at a time. Now fit and join the first set of halves to each other like this: Saw the innermost end of one half to a 90° angle using your straightedge, then overlay it onto its mating piece, sliding it left or right to create a good grain match at the joint. Trace the cutline onto the mating piece, saw it, and tape the two pieces together. Repeat to make the three remaining borders. Attach the Vj¿-in.-wide holly banding on the inner edge of the border. I order the precut banding veneer rather than cut the tiny stuff myself. (Sec Sources.) To attach it, pull it against the border, and apply short lengths of tape every few inches (sec top middle photo, opposite page). Trim off the overhanging tape with a sharp knife. You should now have four borders ready for attachment. Carefully center one of the borders against one edge of the field. Mark and saw a miter on each end of the border so it aligns with the field's corner, and tape the border to the field. Center the next border on an adjacent edge, tuck it under the first border piece, and mark the miter cut. (See top right photo, opposite page.) Mark the other end at the corner of the field as before. Saw the miters, attach the border, then fit and attach the remaining border pieces. It's time to glue the chessboard veneer to one face of your MDF substrate. I apply a secondary, less expensive veneer like mahogany or maple to the back of the substrate to prevent warpage. Cut three -^-in.-thick MDF panels about an inch larger than your chessboard veneer. You'll use one panel as the veneer substrate and the other two as clamping platens. Gather up the necessary clamps, some waxed paper, and a few long, thick pieces of wood to use as cauls for applying even pressure across the platens. (See left photo, above.) Make your secondary veneer to the full size of the substrate, taping smaller picces of veneer together if ncccssary. Spread glue on one side of the substrate and lay it onto your secondary veneer. I use white glue for its long open time. Then glue the chessboard veneer on the opposite face of the substrate, with its grain oriented in the same direction as the secondary veneer. Press the veneers firmly into the glue using a roller. Then place the chessboard between the MDF platens with waxed paper between the board and the platens. Place your cauls and clamp everything tightly. When the glue is dry, you're ready to saw or rout the board to its final si/.e. I sand the tape off near the board's corners to expose the holly banding. Then I mark the finished width of the border, measuring outward from the banding. I'll retrim if ncccssary to make the border meet neatly at the mitercd corners. Saw the veneer edging strips V4 in. wider and 1 in. longer than the edge of the chessboard. 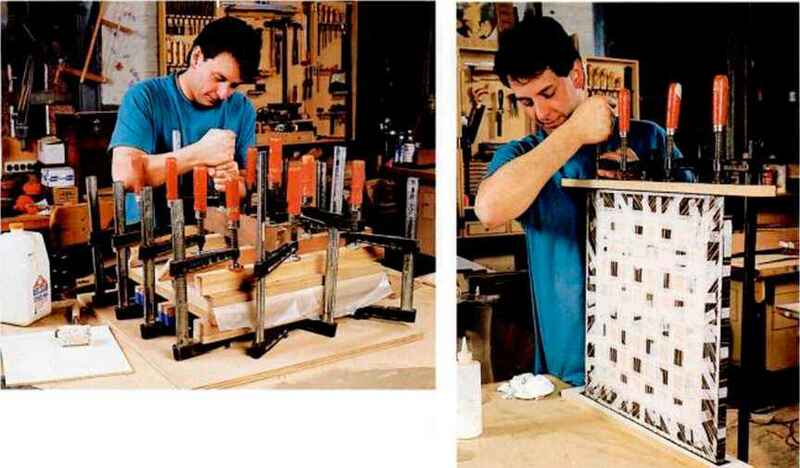 Then glue and clamp them to the board. (See right photo, above.) Glue the first two opposing edges and trim them flush to the board with a laminate trimmer or veneer saw. Then apply the last two edges and trim them flush. Finish up by sanding the board and filling the inevitable gaps or voids in the veneer. I sand with 120- and 220-grit paper on a random-orbit sander to remove the tape and smooth the veneer. Keep the sander flat on the work; tipping it can create depressions or sand through the veneer. FRANK POLLARO is a professional woodworker in New Jersey. For a closer look at his shop and work, see "Gallery, M (page 114) and "Shop Visit, " (page 90).